Tried soldering wires to a copper tape/foam test piece, with nice results for insulation and continuity. Applied heatshrink to torroids and soldered coax to antenna dipoles. These also test nicely for insulation and continuity. Consider hooking up to a radio, but resist, as it is bonded to the table with the wrong polarity. Fitted coax/torroids into channel with urethane bond, fixed with toothpicks. 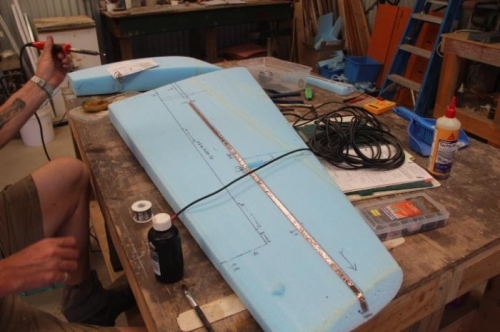 as I did the Rudder conduit into the upper surface of the Wings. 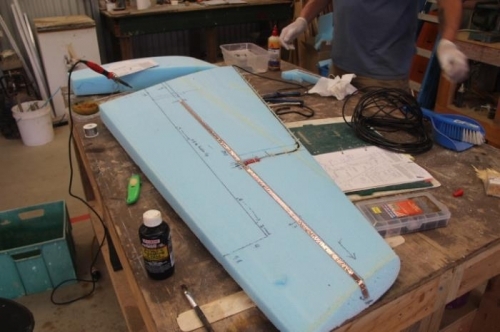 Spend some time reading up on the skin layup schedule, and at this point figure out the antenna is supposed to be on the inner surface. F*&k! Too late to change now, but will do the other as per plans. Prep sand all foam surfaces and fix the assembly strips on the back surface of the supporting blocks to the bench with 5-min epoxy blobs. Maybe too many. Trim coax to a total of 170", aiming to leave 2' of excess at the Wing root for installation of a connector. Check that I have enough coax on hand , I have another 170" for the other Winglet, and 200-odd" for a run from each Wing connector to the IP. After a long break start trimming glue blobs.